Do you fear the calculations you might have to perform to become a pharmacy technician? It is not an irrational fear. There are certainly a lot calculations that must be performed on the PTCB Exam as well as in the day to day operations in a pharmacy. 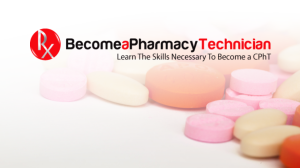 My online class “Become a Pharmacy Technician” has an forum for asking questions. 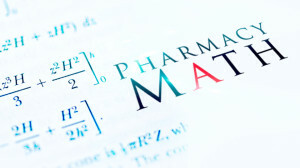 Without a doubt the most common questions asked by students in the class is regarding pharmacy technician math. Some students just have that innate ability to perform pharmacy calculations without much repetition or study. I certainly was not that fortunate. For me and most students it takes time and repetition to master some of the math concepts needed in a pharmacy. Ratio and Proportion, Allegation, conversions, and all of the other pharmacy technician math skills needed can be quite intimidating. This especially true if you are in a classroom environment where it seems everyone is “getting it” except for you. For myself, I needed repetition. I needed to be able to watch the teacher perform calculations over and over while I followed along with my own notes. After 10 or so times of being taught and retaught the material – I would start to grasp it. In college algebra – I even rented VHS tapes to help me along. Yes – VHS tapes, it was a rough time. In the age of streaming video, learning has become a much easier task for me. I can watch an instructor solve a problem 100 times in a row if I wish. Wanting to utilize the technology, I teach pharmacy technician math in this fashion in my class. I have tried to use several visual aides such as graphic slides and birds eye views of me performing calculations by hand. Using this method can help when doing common pharmacy technician math tasks. For instance, in the pharmacy technician class you will need to learn how to convert from % to mg/mL (and from mg/mL to %). Another example might be to convert from degrees Fahrenheit to degrees Celsius. You could be told how to convert the calculation. You could also read how in a book. 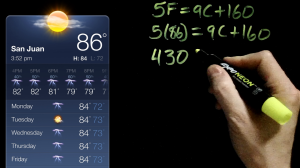 It is my opinion that observing someone perform the calculation and following along with your pen and paper is by far a superior learning technique. Math is easier when you can watch it over and over! How do you know the lyrics to your favorite song? My guess is you know it because you have heard it over and over again. Repetition allowed for you to recite the lyrics even if you didn’t want to know them. You couldn’t get that song out of your head. This can be the case even with songs you don’t like. You just can’t “unhear” them. Math is incredibly similar. Enough times seeing the calculations done in addition to solving problem after problem on your own can result in you solving math problems without frustration. Pharmacy Technician Math is best learned either in person or on video. When making the math videos for my class I tried my hardest to make the problems both worked out in text on my slides as well as on the dry erase board (check out the picture on the right). Also – my students don’t have that weird quirk of live lectures where the teacher’s body seems to block the most important part of the math problem. Pharmacy Technician math is sometimes learned a step at a time. It can be VERY frustrating to get stuck at step 2 of a 10 step process. So what happens then? My solution is to ask someone that understands step 2! This is where an online class can help. You can ask questions in an online discussion board. In my own class, either other classmates will answer students questions or I will jump in and answer. I even take a picture of my work if needed. Anyone studying for the Pharmacy Technician Certification Exam will have to master pharmacy technician math. The calculations can be such a tall task that many students will simply quit. Readers of this blog won’t need to run away. Take a quick look at my streaming online class and see if you could benefit. Clicking the picture at the left will save you $150 off the regular price. It is a great low risk high reward investment! Nominate a Pharmacy Technician of the Year! 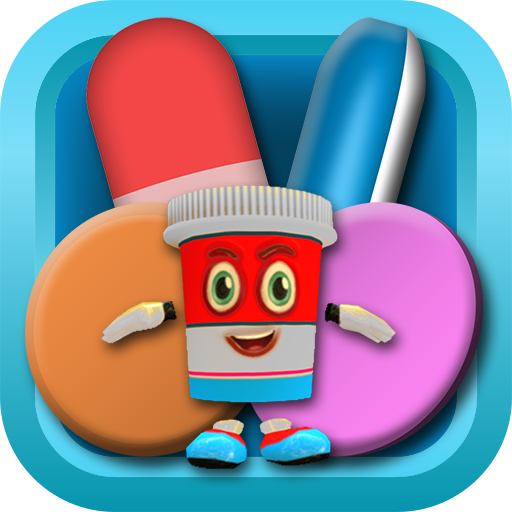 Dr. Steven Pettit is a retail compounding pharmacist at a large independent pharmacy. 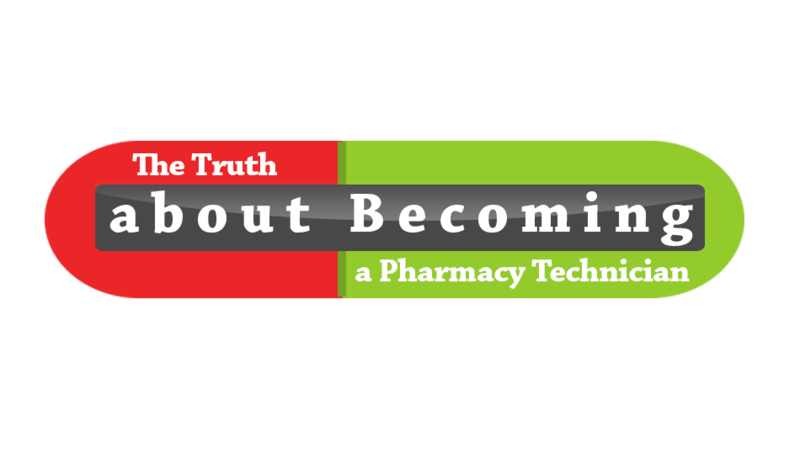 His experience inside a compounding pharmacy has equipped him to teach a variety of topics. In addition to filling prescriptions, He has also taught at a variety of classes and seminars covering topics such as medications for Parkinson's disease, menopause, and bariatric surgery. Steven completed his undergraduate work at the University of North Texas and later obtained his Doctorate in Pharmacy (Pharm.D) from Texas Tech School of Pharmacy. He is cute but he isn't so friendly to sickness causing monsters. Help him attack!